Discover the secrets of the iconic vehicles from the Marvel Comics universe. They may be best known for getting around on their own steam, but sometimes even Marvel Super Heroes need some extra torque. 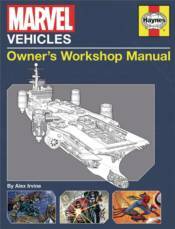 This Haynes Manual takes a look at the amazing vehicles of the Marvel Comics universe, from the X-Men's supersonic jet, The Blackbird, to the mighty Helicarrier that transports the Avengers into battle and the Green Goblin's preferred method of travel, the Goblin Glider. This lavishly illustrated book forms a comprehensive guide to the iconic vehicles that have helped make the Marvel Universe so rich and compelling.